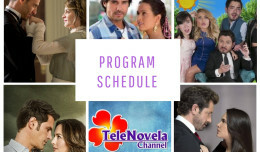 In the Name of Love: Episode 4 | TeleNovela Channel - Bringing you closer to lifes drama. Eight years later, Emiliano Sáenz Noriega returns to Real del Monte and runs into Paloma and Romina—unaware that he is a friend from their childhood. Diana, delighted of her son’s return, begins to plan Emiliano’s future. Romina, antsy about Emiliano’s return, finds it hard to focus on school and her daily life, devises a plan to go out with her boyfriend. At Emiliano’s welcome home party, Romina kisses Emiliano in front of Paloma and announces that they are already lovers.